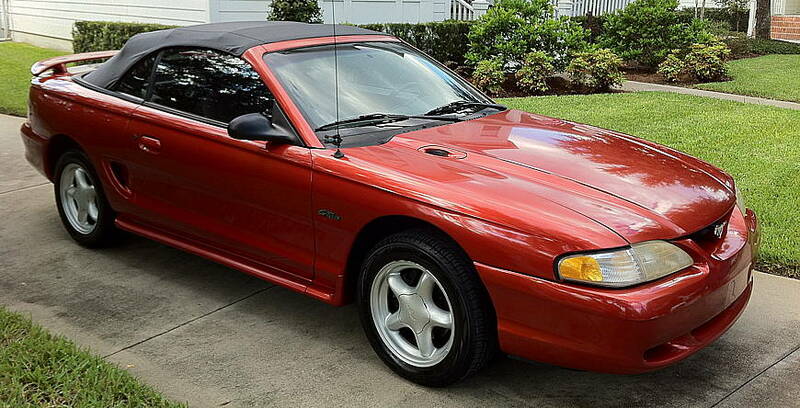 Jill has a ’97 Ford Mustang convertible. Beautiful car, powerful, if a bit thirsty for fuel. That last part became a problem a few years ago when she took a job in Lake Mary, which is an hour-and-a-half’s drive each direction. It became quickly apparent that the fuel costs alone would drive us to the poorhouse; so that’s when she bought the Honda Element, which is gentler on the budget and more comfortable to drive that distance. Fortunately she decided to leave that job, but we both still drive the Element, and her Mustang has been sitting unused in the garage for long stretches of time. Jill has been wanting to teach me how to drive a manual transmission, but something always comes up and scuttles those plans. So while the car has been sitting unused, the battery died; Nick (our mechanic) put a new one in and we let it sit too long again and THAT battery also died. So as of two weeks ago we have a NEW new battery. I tried a few times. Then she took the driver’s seat and SHE tried it. Nothing – the car was completely dead; no signs of life at all. We debated our options. Called Nick, but his office is closed on weekends. There’s a Pep Boys shop in Celebration but it has terrible reviews of ripping people off, so Jill put the kibosh on that idea. We settled on the Disney Car Care Center (which is close to the Magic Kingdom). I’ve used it before; they do okay work but their desk staff have poor people skills. But it’s close and it’s open so we called and arranged to have a flatbed truck come to us. I found a tool in the trunk that Jill believes is for raising the convertible top by hand, but we couldn’t figure out how to do that. So she walked home to get the Element while I waited for the truck driver. He arrived at the same time that Jill got back. He looked under the hood for about half a minute, jiggled the battery cables. “Why don’t you try starting the engine for me?” he asked Jill. She tried. The engine started right up. “Your lead to the battery’s positive terminal is corroded,” he showed me. “There’s probably a break in the wire and for some reason it lost contact.” We decided to skip the tow; we’ll arrange for Nick to come pick it up sometime to fix that. Meanwhile we offered to pay the gentleman for coming down and helping us; he didn’t charge us, but we gave him $20 anyway for his trouble. “Let’s not try driving lessons again for a while,” I said to Jill. It does take practice with the manual transmission, but it’s a skill worth knowing. Especially since not as many people seem to have it these days. And to perhaps help stop an endless supply of battery replacements, if the car is going to sit for long periods of time you can get a trickle charger to hook up to the battery that will keep it from dying. As that is what we do for the corvette when we stow it in the garage for the winter. Otherwise, we’d be getting a new battery every spring ourselves.